And finally here's my last book of 2018. Not reviewing any books in November 2018 really put me behind, and I'm sorry. Happy New Year, anyway. I hope you read some brilliant books in 2019. I needed a small book to read on the 30th, because I wanted to get to a nice round 80 and I knew I wouldn't have any time to read on the 31st. I usually read in bed and after you've been out on New Year's Eve who's got time for reading? Not me, for sure. I plugged my phone in to charge at 2am and went to sleep. Lee pulled out a few short books for me, and I picked this one up. It's yet another of those short Barrington Stoke books which are easy to read and good for dyslexic people, I must own at least ten of these novellas and I think they're great little stories. This book is about Jess, who is seventeen years old and who, at the beginning of the book, has just had a baby with her boyfriend, Nick. 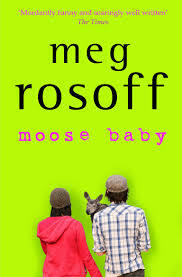 Only this is no ordinary baby... Their baby is a moose. A bit unusual, sure, but Jess and Nick soon get used to it. They have to navigate social workers, nurseries, and puberty, all before they're twenty-one years old. This is a really funny book, I liked it quite a lot. I'm giving it four out of five.